The amazon affiliate program is a pay per action program where you get paid to refer clients to buy products from amazon. There are three steps involved; join, advertise and earn. It is free to join the amazon affiliate program. To join the program, amazon will needs to collect demographic information from you including the URL of the website you plan on using for adverting their products. It takes sometime for amazon to approve your application. First they have to visit your site to determine if it qualifies for the program. Before applying, make sure you have enough good quality content on your site and also that you have a good and steady amount of traffic. It might take weeks before your site is accepted. Once approved, you can log in to the amazon affiliate program to generate links for your site. On the home page of their website, there is a search box where you can search for any product you want to advertise. Once you enter your search term, a list of products are displayed, each with unique links you can copy and paste to your site. There are two types of HTML links. The first type can be used to display per-designed images, texts or image and text referring to the product of interest on your site. The other link is designed to link an already existing text or image on your page. If anyone visits your page, click on any of these links and buy the products you are referring, you get paid a percentage of that sale price as commission. You will also get commission for any other products that person buys during that visit. If someone comes to amazon from your site and place an item in their cart, you will be paid commission if that person buys that product with 89 days of visiting the site. Commissions are paid once a month but before you get paid, you will have to set up a payment account and supply amazon with tax information. 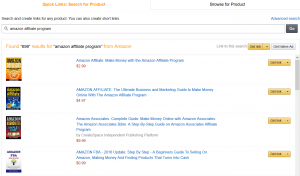 What other affiliate tools does amazon offer? Amazon offers other ways of displaying products on your site. You can create native ads that blend with your content and display adds relevant to your content. There are two ways of generating a native ad. The easiest way is to search for a product in the search box on the home page and enter for results. Another tool offered is the ability to add banners to your site. You can customize banners to reflect the content of your site. You can also build unlimited numbers of amazon stores with this program. You can place these stores in your pages or post or you can make a whole page just for this store and when people visit your site, they can go to this store and buy things directly without having to go to the amazon website. This store is run by amazon and you don’t have to pay to have one. 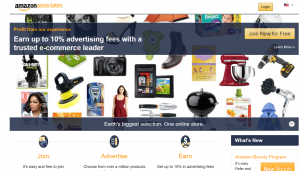 Amazon offers many other features like promotions, bounties, site stripes and more. To read further about the amazon affiliate program, click here. What reasons does amazon give for rejecting a site? If your site violates intellectual property rights. If you do any of the things listed in the rejection list above after your application has been accepted, amazon will cancel your membership and annul their contract with you. Amazon will also close your account if you don’t make any referrals within 180 days from the time your application was approved. By referral I mean those people who go to amazon from your site and make a purchase (clicks don’t count). The good news is, you can reapply. It is however advisable to wait until your site is receiving steady traffic before you reapply. The reporting tool is easy to follow. It displays in a simple graph your clicks, referral and earnings. You can earn up to 10% in commission but it usually stars at 4% and increases gradually. 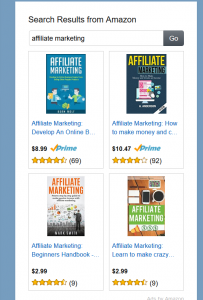 If you are tired of working a 9-5 shift and want a way to make extra income, you can do so by becoming an affiliate marketer. There hundreds of businesses online that are ready to pay generous amounts for your referral. Affiliate marketing is a popular type of business and is a low income way of starting off a business. 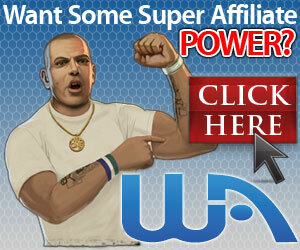 In fact, you can start off for free with wealthy affiliate. They will help you build up to two websites for free and will teach you what it takes to become a successful affiliate. Take control of your life today! If you have any experience in affiliate marketing, please leave a comment. Don’t hesitate to ask you questions below.